Text messaging is still one of the simplest way to communicate with colleagues, friends and family members. If you were a regular texter like most of us then it is quite expected that you have a huge inbox. Indeed, these messages are meant to stay on the iPhone forever and that's why it becomes a painful and stressful situation when we accidentally deleted our text messages or a total data wipe caused by a factory reset causes. Unlike Android smartphones, iPhones do not offer any app that could bring back your deleted text messages, which makes it extremely challenging to restore the messages of our iPhone. Fortunately, after researching and testing countless methods, we have found out three working methods that can recover deleted text messages from iPhone. In this tutorial, we are going to demonstrate all those methods so that you can retrieve your erased text messages as many as possible. iTunes is an exclusive software available for iOS users to manage their device on a PC or Mac. One of the most important functions is for data backup. So If you have synced the iPhone with iTunes before losing those text messages then you are in great luck. You can restore the text messages from iTunes easily by following the steps listed in below.. Step 1: Connect the iPhone to PC and iTunes should be launched automatically. If not, then open iTunes manually on your computer. Step 2: Go to devices and choose your iPhone name. Next, click on "Summary" and you should be able to see the following screenshot. Step 3: Click on "Restore Backup" and choose the recent backup file from the given list. Step 4: Wait for few minutes and the backup file will be restored. Now open the inbox on your iPhone and it should show all the text messages back on your device. Warning:　this method rewrites all the existing data on your iPhone, meaning all the new text messages after backup will be deleted at the same time. So make sure backup the device before restore. One of the simplest ways to recover deleted text messages from iPhone is to use Androidphoneosft iPhone Data Recovery. It is one of the most powerful iPhone data recovery program that can retrieve all types of deleted data from iPhone, iPod or iPad. In addition, it is compatible with Mac and Windows computers and support 40+ file types, including messages, contacts, music, pictures, videos, documents, etc. Plus, it has built-in features to extract content from iTunes or iCloud backup without overwritting the existing data, which is a huge advantage over iTunes software. What is more, it supports the latest iOS 11 and new iOS devices like iPhone 8, iPhone X, iPhone 7 as well as iPhone 6S/6/5S. 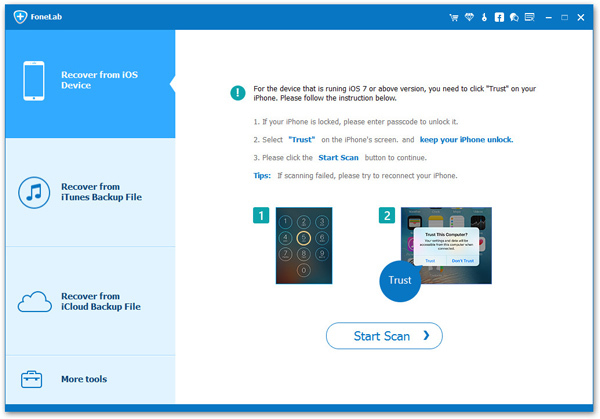 Download the recent version of iPhone Data Recovery program on your computer and install it by following the prompts. Next, open the software and get the iPhone connected to PC. You have to trust the computer on iPhone if the device was the first time connected to this computer. From the left sidebar, you can see three options. At this time, choose "Recover from iOS Device" and let the program fully scan the entire iPhone. Please note that it may take several minutes depending on the storage capacity of your iPhone. Once the scanning is done, you will be able to preview all the messages from that iPhone and choose "Messages" tab from the sidebar to see all the deleted texts. Finally, choose the text messages that you wish to restore and click on "Recover" button to save them on your computer. That's it. You have successfully recovered your deleted text messages and now you can store them back to your iPhone. 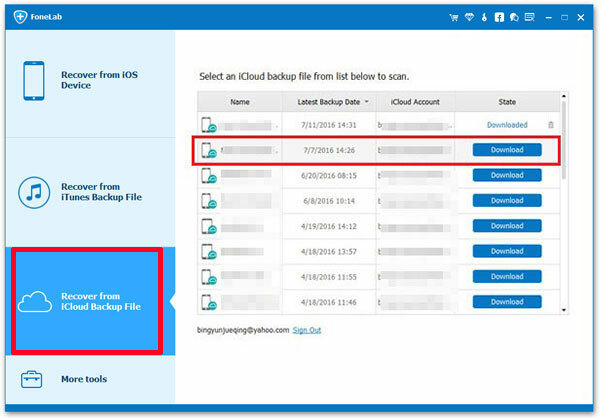 iCloud is yet another cloud services similar to iTunes that helps iPhone users create a backup of the device whenever you sync your iOS device with it. Fortunately, you can use the same iPhone data recovery tool like above to retrieve the deleted text messages from iPhone but this time, using your iCloud account instead. 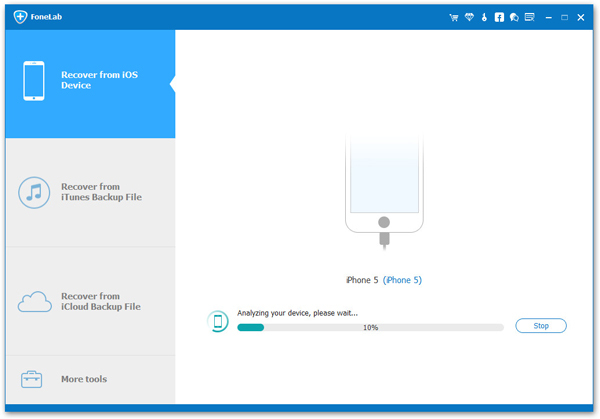 Launch Androidphonesoft iPhone Data Recovery tool and this time select "Recover from iCloud Backup File". 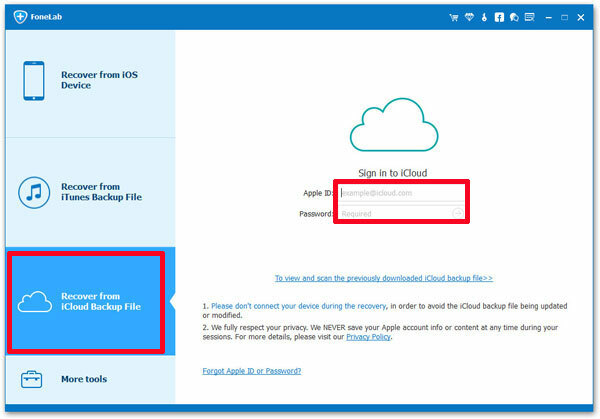 Enter your iCloud login details directly inside the program and login. Don't worry this tool never saves any of your login credentials as it is trusted by millions of satisfied customers. 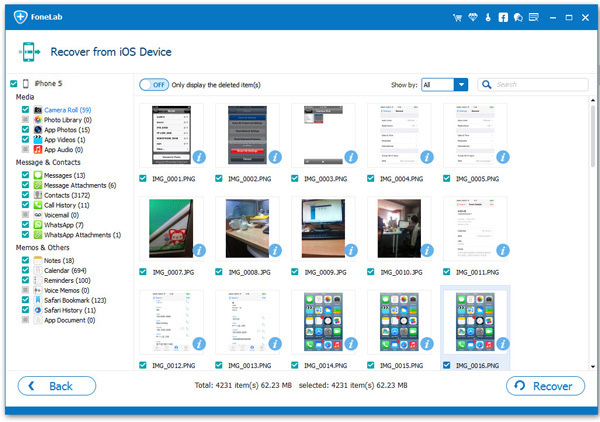 Download the recent backup file from your iCloud account and scan it with iOS Data recovery tool. After the monitoring progress is completed, the program will again show all the data from your iCloud backup file. Simply hover to the text messages section and retrieve all the erased text messages. Done! Your text messages are successfully recovered and you may now have fun! In this comprehensive guide, we have proved that recovering text messages from iPhone is certainly possible if you know the right tricks. However, it is highly recommended that you must make a complete backup of your device to avoid any kind of data loss in the future. But remember, even if you accidentally remove data from iPhone then Androidphonesoft iPhone Data Recovery software is always ready to restore your deleted files easily.